The “Documentation” link I mentioned is wiki.openstreetmap.org. 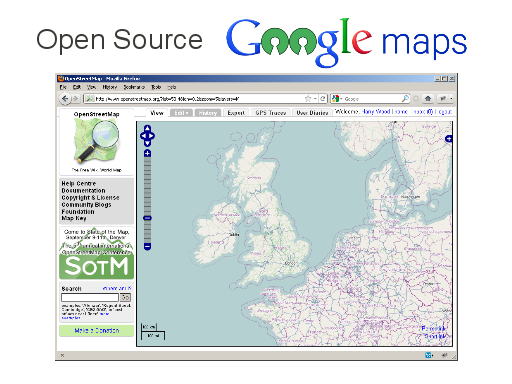 Find out all about the OpenStreetMap project there. The video featured here is an animation of OpenStreetMap edits back in 2008 (It’s stunning. 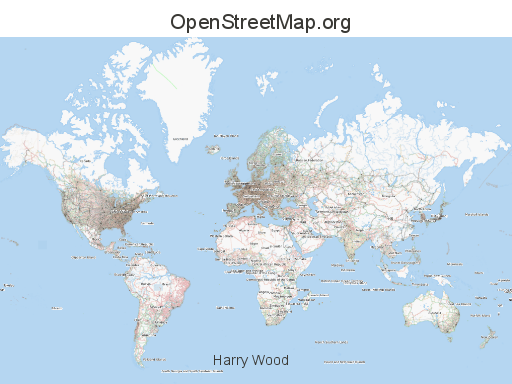 Watch it full-res for the best effect) There’s even more worldwide editing activity on OpenStreetMap these days. …which is a big problem with creating video. I spent hours and hours on this tutorial video. The results were not really worth the time it took (That tutorial is now out-of-date for several reasons too) At the time I realised that I could have achieved almost as good a video by practising a few times and then recording the whole screencast in one take, rather than doing things piece by piece and editing clips together, which just takes forever. 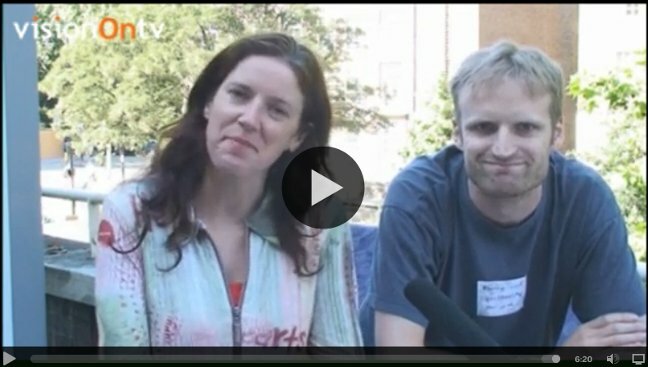 This interview video is not a slick pitch. I’m concentrating on trying to explain OpenStreetMap in a persuasive way, and as a result I’m furrowing my brow and looking too serious. And when I first watched it back I thought I’d really failed to get various important messages across, particularly about the open data aspects of OpenStreetMap. But I guess that’s the short video way. Dumb things down and miss out the details. I feel better about it when I see a facebook comment from my (non-techie) sister saying “good explanation, I get it now!”. 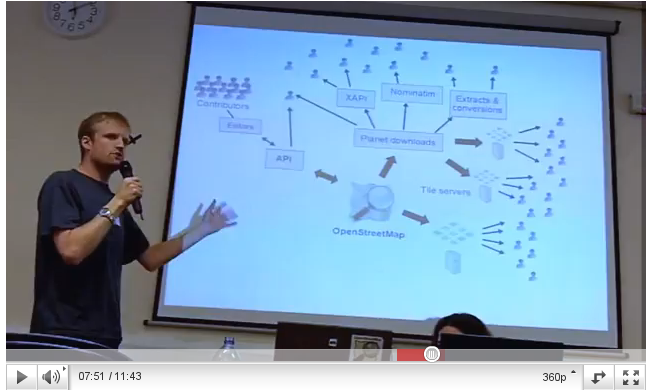 I gave a talk at OpenTech 2011 yesterday. This is a big open source open data London technology conference. A lot of fun. I gave an overview of the developer ecosystem around OpenStreetMap data, how web and mobile app developers can use OpenStreetMap, and how the OpenStreetMap tile server is only a small part of that. This included a whole sequence of shiny new slides to illustrate these points by gradually building up a nice diagram. The session listing on lanyrd has some photos etc linked from there. If you’ve only taken a quick look, you’ll perhaps have the idea that OpenStreetMap is an open source competitor to Google maps. It kind of is that, but that’s not really the whole story. 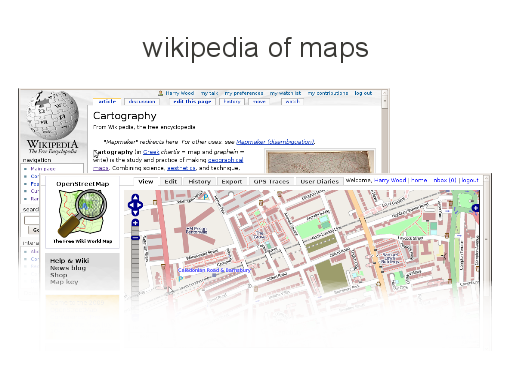 It’s more accurate to compare OpenStreetMap with wikipedia. It is very much the wikipedia of maps. Similar for a number of reasons….